Earth’s Oceans are Warming Up! ”] As sun light hits the Earth a tremendous amount of energy, mainly in the form of heat, is absorbed by the oceans around the world. This heat warms ocean waters, mainly near the surface, which then transfer some of this heat to the atmosphere influencing weather patterns and over the long term climate. Several polar and geostationary satellites continuously take measurements of sea surface temperature. These sea surface temperature [SST] data are then combined, blended, on a daily basis to produce global maps of sea surface temperature such as the one shown above. Colors from blue to red identify cold, temperate and warm surface waters. These SST maps also show currents and other ongoing ocean processes, which reflect a dynamic heat distribution system. SST maps are useful for meteorologists that use them to help in weather predictions, and also to navigators to help chart currents and researchers. These SST maps are critical, together with atmospheric data, in tracking the process of cyclogenesis [tropical cyclone formation] throughout various ocean basins worldwide. In the map above it is easy to see how much warmer surface waters are at the equator and to the south of it than in the northern hemisphere, reflecting the ongoing summer season in the southern hemisphere. As the Earth’s axis continues to tilt northward we will see SST maps charting a shift of warm ocean water to the northern hemisphere as the seasons reverse. This maps also shows an area of temperate water along the coastline of Peru, which identify the remnants of a La Nina event that developed in 2010 and affected weather patterns over northern South America, Central America and the Caribbean and also in Mexico and the USA. Back in 1995 I was a consultant to an architectural/engineering team that had been charged with evaluating the vulnerability of a major hospital, located near the coastline of southeastern Florida, to the impacts of hurricanes. The assessment of vulnerability had the objective of determining if there were practical alternatives for the hospital to exercise in lieu of the mandatory evacuation it faced in case a hurricane warning were to be issued by Miami-Dade County, which carried a mandatory evacuation order. Evacuating a major hospital, as I discovered while I participated in that study, especially one where a large percentage of the patients require intensive care or are frail and elderly, is truly a major and critical undertaking. In addition, evacuation of a hospital raises critical issues of respnsibility for patient care, access to medical records, patient safety, and liability. My participation in this project led me to propose “Sheltering-in-place”as an alternative to evacuation for major hospital vulnerable to the impact of hurricanes. This proposed alternative survived a rigorous process of debate and peer review involving professionals in several disciplines and representatives from the state and county governments, and in 1996 became the accepted paradigm in Miami-Dade County. and intracoastal waters, coastal bathymetry characteristics were gathered to paint a picture of what could happen at the site under the impact of a hurricane. In the course of doing this I made one important discovery. Existing surveys and site plans for the hospital campus did not reflect the actual conditions of the place in 1995. To begin with the survey of ground elevations and elevation of ground floors of the several building on campus was based on NGVD (National Geodetic Vertical Datum), meaning mean sea level as it had been measured back in 1929. I realized then I needed to determine what these various ground and building elevations with respect to mean sea level were in 1995, so that we could take into account any changes in sea level from 1929 to 1996. Research of tide-gage records and several data sets maintained by NOAA indicated mean sea level at this location in 1995 was 0.23 meters above the 1929 NGVD. This was a truly significant discovery for two main reasons: (a) it meant ground and building ground-floor elevations were 23 centimeters lower with respect to mean sea level than indicated in site survey and plan documents, (b) it also meant the potential impacts of storm surge and coastal flooding during hurricanes would result in higher water and wave heights. In summary, the hospital facility was more vulnerable to these impacts in 1995 that it would have been in 1929 if it had been built at that time. What truly made this a critically significant discovery was the realization that as sea level continued to rise in the future the potential impacts from storm surge, waves and coastal flooding would be exacerbated increasing the vulnerability of the hospital, hence its potential for damage under the impact of hurricanes. My research at the time also showed that all available sources of data to assess the vulnerability of the site, such as flood maps and storm sure atlases were all based on NGVD 1929 and did not make any provisions for sea level rise. I also found that design standards, such as ASCE-7 (American Society of Civil Engineers – Standard 7), were also based on references to historical data of sea level and flood elevations and did not include methodology to make corrections to account for historical or future changes in sea level. Clearly this was a situation that needed to be corrected in order to arrive at more accurate estimates of potential damage to buildings and infrastructure from the impact of hurricanes. It is now 2011, sixteen years later, and while some changes have taken place much remains to be done. Most land surveys and ground elevation studies are now using AVD-88 (the American Vertical Datum of 1988) as the point of reference and several data sources now exist that allow for far more accurate determination of current mean sea level as well as estimations of future mean sea levels at specific locations. Unfortunately the sobering reality is that design criteria for building and infrastructure design and construction have yet to incorporate provisions to account for the impacts of storm surge and waves and coastal flooding as these hazards continue to be exacerbated by sea level rise. On a positive note it is good to see that here in Florida the state government and other entities are focusing on the potential impacts of climate change, publishing important studies and documents on these topics. The Florida Ocean and Coastal Council is one of such agencies, which in 2009 published “The Effects of Climate Change on Florida’s Ocean and Coastal Resources” a peer-reviewed document with the objective of educating the state legislature and the general public on what we know about these potential climate change impacts based on current state of science, what is probable and what is possible in term of potential impacts. I was one of the contributing authors to this study and worked on it during 2008 and 2009. 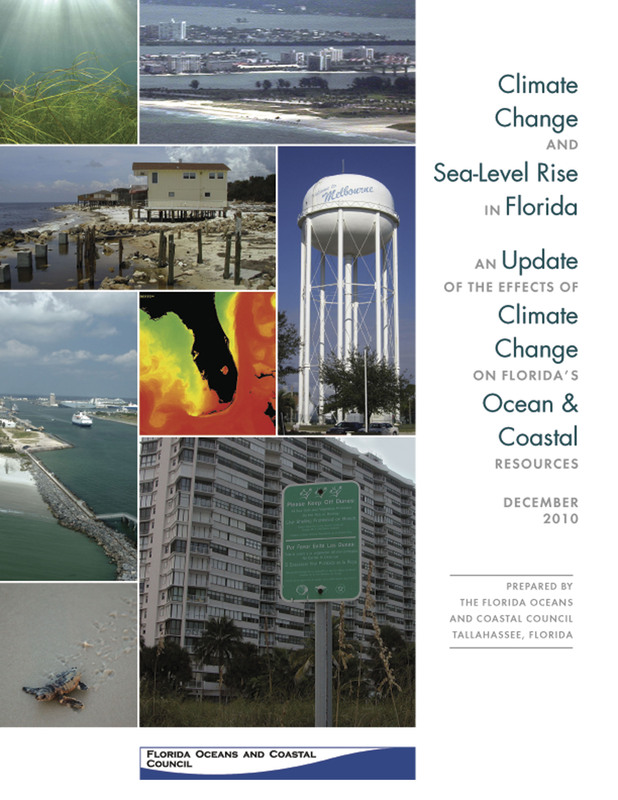 A new peer-reviewed report also commissioned by the Florida Oceans and Coastal Council, “Climate Change and Sea Level Rise in “, has just been published ( click on following link to read this report, Climate Change and Sea Level Rise.) As with the previous study I was also a contributing author to this one together with several other Florida scientists and members of the council. My specific contribution was in the area of impacts to the built environment and coastal infrastructure, a chapter that was edited and coordinated by my good friend Karl Havens, Ph.D., from the University of Florida who is also Director and Professor of Florida Sea Grant College Program. This report provides an excellent foundation for various sectors to identify adaptation alternatives, which may prove effective in reducing the potential for damage from the impact of hazards driven by or exacerbated by climate change. It is clear than in a state such as Florida, a narrow low laying peninsula, where must of the urban development and infrastructure is located on the coastal regions, sea-level rise exacerbated storm surge, wave impacts and coastal flooding constitute critical factors in the development of design-criteria for future buildings and infrastructure and for the retrofitting of existing facilities and built-environment if we are to have a chance of adapting to sea-level rise and its consequences in the future.